The novel that scandalized Lynnfield! Imagine you’re a small-town girl from New England, raised by two maiden aunts. Imagine you’re a Sunday school teacher and the church organist. Imagine that you can barely sneeze without the entire community knowing about it. Then imagine that in the midst of all this, you’ve written a racy best-selling novel that has taken the world by storm under a pseudonym. How do you manage to live your life while keeping the truth from everyone you know? That’s the plot of Theodora Goes Wild starring Irene Dunne. With the publication of The Sinner by Caroline Adams (Theodora), the Lynnfield Literary Guild is up in arms. The local paper has serialized the scandalous novel and the guild wants it banned. And it’s up to Theodora to tell Jed Waterbury, (Thomas Mitchell) editor of the local paper, of the guild’s intentions. (Melvyn Douglas), who thinks that Theodora needs to let her hair down. Grant, however, has stayed in a loveless marriage to appease his politically ambitious father. Theodora may need to let her hair down, but is Mr. Grant the right person to be telling her so? With Theodora Goes Wild, Dunne entered a new phase in her already successful career. Starring in her first comedy, after years of specializing in weepy melodramas, she was a revelation. 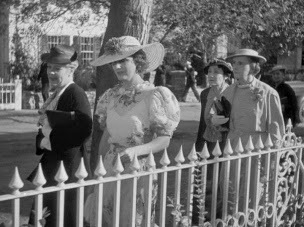 With this one role, Dunne established herself as one of the silver screen’s great female comedians. Her turn as Theodora Lynn earned her a second Best Actress nomination, alongside fellow Hoosier, Carole Lombard, nominated that same year for My Man Godfrey. Louise Rainer who won for her performance in The Great Ziegfeld shut out both actresses. Theodora Goes Wild will be screened as part of the Chicago Film Club’s “Screwball Comedy and the Feminine Mystique” film series on November 19, 2013 at 6:30 p.m. at the Daystar Center, 1550 S. State St. For information on the Film Club, click here. For information on purchasing tickets in advance and parking, click here. On street parking is available, but if you want to park in the Daystar parking lot, you need to buy your parking ticket in advance. Tickets will be available at the door for $5, $3 for students and senior citizens. I hope you do. I think you will enjoy it. It's a lot of fun. This would be sooo fun to see on the big screen. I really have to see this again -- the casting is brilliant. I've screened it before and audiences loved it. Most had never seen or even heard of it before. I agree, the casting is brilliant and the more I see it, the more I appreciate just how good it is.